What is primitive fire starting? 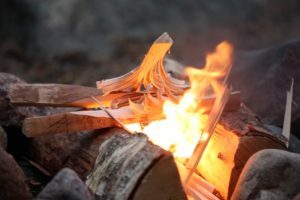 The simplest answer is that it's any method of fire making that doesn't resort to the use of modern materials and tools invented since the turn of the 20th century. Mankind has been using fire for many thousands of years, and the further back you look, the greater the role that fire played in daily life. The first methods of primitive fire starting were friction-based, involving the generation of heat by rubbing sticks together. Why Is Fire So Important? In the beginning, fire was used as a source of warmth, to scare off wild animals and to cook food. Afterwards, it began to be used in the production of pottery, glass, bricks and metals. Today, our mastery of fire allows astronauts and their cargo to orbit the Earth, as well as allowing millions to drive their automobiles around. To build a fire using matches or a lighter is uncommonly easy nowadays. But, have we always made fire this way? Just 70-80 years ago, lighters weren't available in many parts of the world and matches were few and far between. As such, people in villages, towns and even cities had to build primitive fires without the use of matches. Nowadays, few of us can make, or even know how to make, a primitive fire without matches or lighters. Even many of the most seasoned hunters, campers and outdoorsmen can't make a fire reliably without the help of match or two. It's our mission at Flint and Steel to change this unfortunate state of affairs. We want to revive the old ways of firemaking so that everyone can enjoy their very own real primitive fire. What do you need for primitive fire starting? For centuries, people used forged firesteels for primitive fire starting. A firesteel is a small, flat, forged metal plate. If you strike the sharp edge of a stone with such a plate, then microscopic pieces of metal will be broken off the plate. These sparks are the very sparks from which fire was made in antiquity. The particular type of stone used was flint, a naturally occurring mineral with very sharp edges. It is these edges that the firesteel would "hack," "strike" or "hew," hence the more ancient and more widely used name - steel striker. Sparks produced by these means then fell upon a special kind of material known as tinder. These sparks caused the tinder to begin to smoulder, and as it became hotter and hotter, it would turn into an ember. Dry grass, flax, moss or bark would easily catch fire upon contact with such an ember. Such was the cunning of our ancestors, who could quickly and deftly get a primitive fire going without using matches or lighters. Cut 5-6 pieces of twine (10-12 cm each in length), and unwind the thread. Separate each thread into its component fibers. Crumple the resulting fibers into a ball. From the metal tinderbox remove a rectangular piece of tinder (char cloth) and place it on top of a flat part of the flint. Move the tinder towards the sharp edge of the flint so that their edges meet as shown. Make sure that the edge of the tinder does not hang over the edge of the flint. Also, the edge of the flint should not be visible beneath the tinder. Take the steel striker and place its long, working surface (the blade) upon the sharp edge of the flint upon which you have placed your tinder. This is known as the "starting" position. Now raise the steel striker up by about 15-20 cm and strike a glancing blow downwards at the edge of the flint. At the moment of your strike, when the working edge of the steel striker comes into contact with the sharp edge of the flint, shards of metal will splinter off the steel striker in the form of sparks flying in all directions. When sparks fall upon tinder, it catches fire and begins to smoulder. One strike is often insufficient and you may need to make a series of 4-5 strikes before you see any sparks falling on the tinder or any part of the tinder smouldering. Place the smouldering tinder inside a pre-prepared ball of kindling and start to blow upon it. Make sure that the burning tinder is in the center of the ball of kindling at all times. You should not blow too abruptly, but rather smoothly and continuously in 3-5 second intervals. This is how you will ensure that there is an uninterrupted supply of oxygen and thus get the hot ember that is the piece of tinder to ignite the fibers of kindling. Once the ball of fibers has begun to burn, immediately place it a pre-prepared hearth with dry kindling and firewood. In our store you can buy ready-made camping kits for primitive fire staring in the woods. You can also buy firesteels separately in our eBay or Etsy stores. For more primitive fire starting videos please visit our Youtube Channel.